The VWR Scientific Analog Vortexer offers you consistent vortexing action, in a compact, minimally vibrating package that can be placed where ever you need it most. This lab mixer has variable speed between 300-3200 RPM, for a gentle shake to a vigorous vortex. 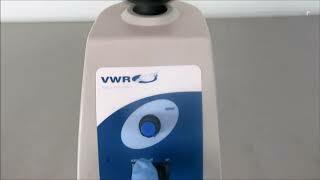 The VWR Analog vortexer can be used as either touch and go for quick shakes or switched to on mode for continuous action. The VWR Analog Vortexer is outfitted for use with test tubes held in the chemically resistant thermo rubber cup, that’s easy to remove and clean. Additional accessories can be purchased to adapt this analog mixer to suit your needs. The base is constructed using a heavy casting with corrosion-resistant enamel finish, designed to keep the units stable on work surfaces. This VWR Analog Vortexer has been thoroughly inspected and is performing to expectations. All of our lab equipment comes backed with our standard warranty. Should you have any questions, please don't hesitate to contact us.